WE INVENTED THE ROLL-UP COVER®! Choose the Best Hot Tub Cover that will save you money! Great Northern® Wooden Foam Insulated Roll-Up Covers® are unique. 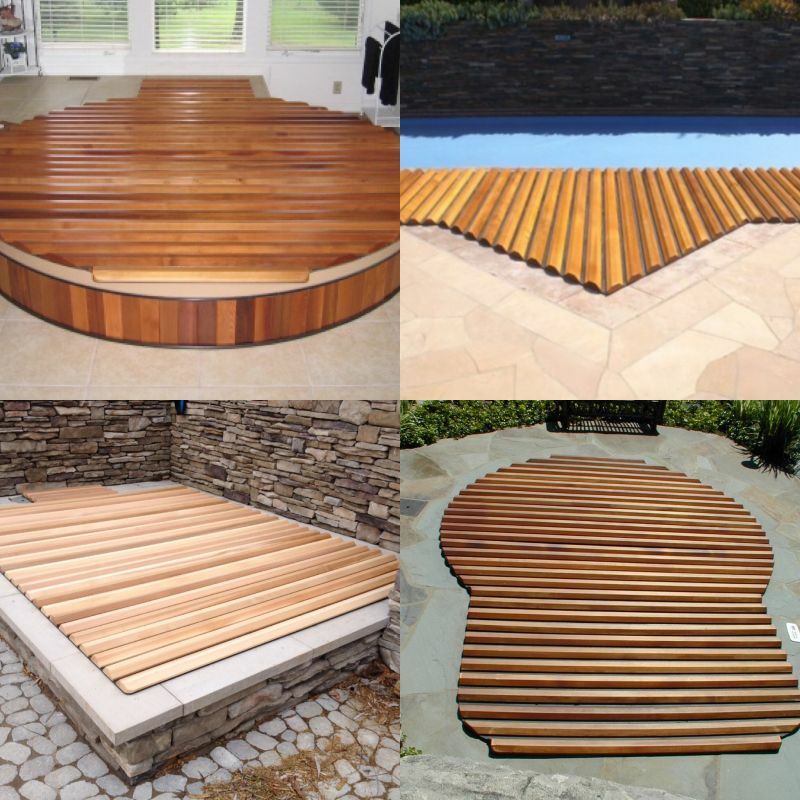 Our wooden Roll-Up Cover® is the only rolling hot tub covers with full-sized, vertical grain, top-grade Western Red Cedar slats, PERMANENTLY WELDED to UV-resistant, flexible, waterproof, Hi R-Value insulating foam. Unlike the vinyl covered Styrofoam Hard Spa Covers, our Roll-Up Cover® is vapor proof, so they don't become heavy with moisture, causing warpage and heat loss. Resting on the top edge of the hot tub, slight compression of the insulation creates an almost hermetic seal, eliminating the major source of heat loss, surface evaporation. Click here for Custom Roll-Up Spa Covers®. Solid covers made from metal, fiberglass or solid foam are often too cumbersome for one person to move and require spa cover lifters. Our hot tub or spa Roll-Up Cover® can easily be rolled to the side by one person and offers superior strength. Say goodbye to spa cover lifts forever! Not only do our covers meet ASTM strength standards, they are the preferred structural covers in ski areas with large snow loads. In addition, our proprietary welding process eliminates the dirt collecting gaps between foam and wood. Hand finished Vertical Grain Wood provides superior strength and resistance to warpage. 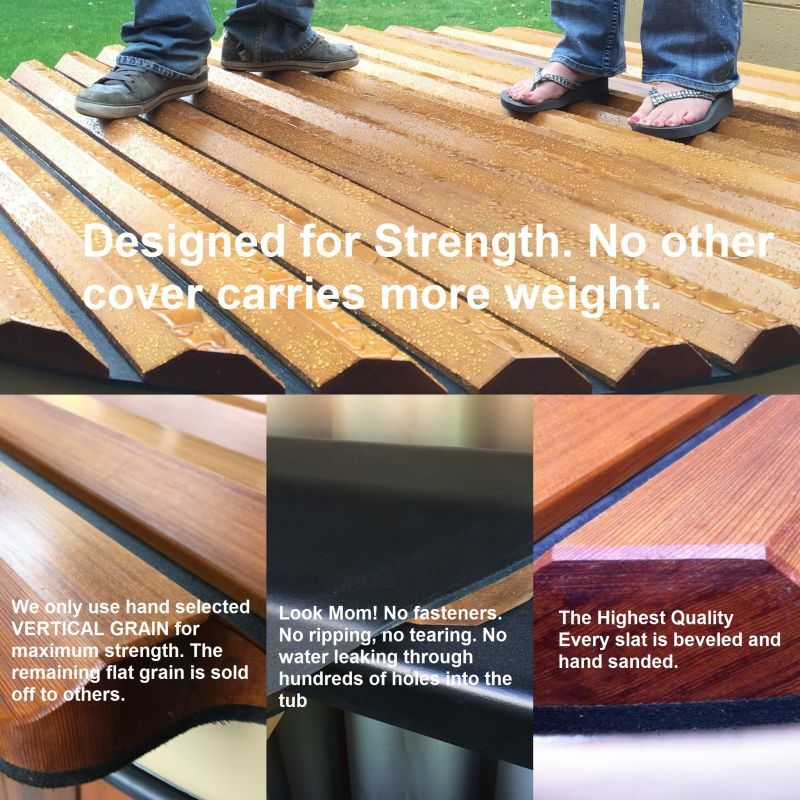 All these features combine to provide a spa cover with high R-value, high strength, and incomparable quality, beauty, and durability...all a part of the Great Northern dedication to making aesthetically pleasing, more functional products. While others sacrifice quality to make them cheaper...we won't. We make the very best! And it comes with a ten year limited "won't waterlog" warranty - the longest in the industry! For a quote, email dimensions to info@gnht.com or give us a call at 763-566-3623. Custom Hot Tub Roll-Up Covers® and special sizes typically require seven or more working days. Quick demonstration of how easy our Western Red Cedar Roll-Up Cover® is to roll on and off this 5'x44" Rubadub Tub®. This cover rolls onto a shelf attached to the back of the tub so you can get full use of the hot tub with the cover out of the way.